Parents, when will you start searching for colleges for your high school aged child? I hope the answer is before their senior year. Waiting until the last minute is common when applying to college – and it’s a mistake! Some schools receive applications just minutes before their deadlines. And they can tell when students submit their applications. 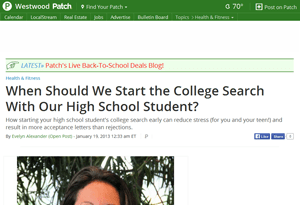 The Westwood/Century City Patch featured an article with my advice on searching for a college. In it, you’ll discover my best advice on when to start your college search, when and how a student should be thinking about their extra-curricular activities, how to plan their courses, and more. It’s valuable reading for parents of high-schoolers in all grades. Many high school students thought they would enjoy two or three weeks of their winter break, but were faced with the reality that they waited until the very last minute to finish their college applications. Not surprisingly, most of them waited until the last possible moment – New Year’s Eve or New Year’s day – to hit the “submit” button [in fact, the Common App reported that they experienced 13.6 form submissions per second in the last 10 minutes of January 1]. And after the initial wave of nausea wore off, there’s one thing that students and their parents all agreed upon: We’re glad that’s done. The only thing that could have made it go more smoothly would have been to start earlier. Given that there are more than 2,200 four-year colleges and universities in the U.S., it’s easy to see how…. Happy New Year! Let’s Think About College!